Help Your Skin. Heal Your Planet. Help the environment as you help your skin with emerginC’s new initiative, emerginCeeds. 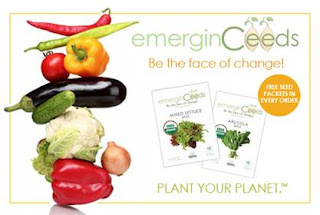 With every product purchased, emerginC will include a packet of USDA organic mixed lettuce and arugla seeds to help start your own vegetable garden. In addition to the new “Ceeds” initiative, emerginC will also continue their ecological promise of planting one tree in an indigenous area around the world, for every product sold. For more information on the new emerginCeeds initiative, please visit www.emerginc.com. I was sent two packets of these seeds. I am in love with the fact that they are organic. That is very important to me. If you have been following my blog for sometime, than you'll know how much I like anything that is all natural or organic. I planted these seeds and am pleased with the amount of seeds that were in the packet. Very generous amount! If you have a green thumb and you have your own garden, be sure to check them out! Also this would be a great gift idea for the gardener in your life! Be sure to follow them on twitter and facebook!